← The Irish Gaeltacht – Triple Bunk Beds and Fridge Freezers…..
Winter has rolled around again. It’s December. For many people this time of the year is one of joy and happiness as Santa comes to visit small children, bringing surprises and gifts. I have always loved winter and have enjoyed the seasonal cheer throughout my life. This time last year however, I was caught up with the care of my terminally ill mother Monnie. She was in the loving care of a hospice as she lived out her last few weeks before her death on January 11th. 2013. Looking back, I recognise now that this period of time was emotionally difficult and completely unpredictable. The days were all caught up with managing visits, linking in with social & health workers, meetings with counsellors and care staff, while all the time I was trying to remain positive and upbeat around my mam. This wasn’t always easy. It wasn’t easy for her either. There were days last December during my visits that we would sometimes just sit in silence. We couldn’t speak about future events because we knew that she would not be around for them. It rendered us speechless. Other times we could gossip about family members, neighbours and friends. We tried to keep it light as we consciously skirted around the fact that she was dying. It was a heartbreakingly sad time for both of us I think. We did have conversations about death, but they were few. Looking back I wonder if I could have been emotionally stronger in order to speak bravely about how life would be without her. I will never know. Christmas Day she was with my husband and I with our two adult children at home in Lucan for a few hours. We were so glad that she was well enough to travel and that she wanted to be with us. Previously over other years she had travelled to my sister in Bristol for the holidays, but not this year. My son Andy collected her in the morning and brought her to our home, where she was fussed over and made comfortable. We had prepared all the things that she liked to eat even though her appetite was poor, and when we all finally sat down to dinner that day the moment was filled with poignancy and emotion… until she asked for gravy. Traditionally my family don’t use gravy, but Monnie stoutly declared that she couldn’t eat her dinner without it. There was a deafening silence around the dinner table that moment as we all looked at each other in desperation and horror, realising that despite my husband slaving away for hours preparing all the little things that she liked, he had forgotten to provide gravy! (This moment will always be remembered as “Gravygate”). Like a true gentleman (with gritted teeth) he left his dinner and went back to the kitchen to prepare her heart’s desire. Minutes later, gravy accomplished, we all enjoyed our last Christmas dinner together. She went back to the hospice that night having spent an afternoon amongst family members who loved her and who were glad to see her enjoying the day despite her frailty. A couple of hours later I received a phone call from my son telling me that mam was asking for me and wanted to see me. I left the house reluctantly and made my way to the Hospice. While on the way my son kept phoning me to ask where I was every step of the way as mam kept asking for me and wanted to know how long I would be. I was short tempered and narky as I repeatedly told him that I was on route. When I got to the hospice my brother and his wife were also present. We all had a great evening with mam and we left her in sparkling form. The following morning my daughter Jayne called me at 8am to say that she was in the hospice after finishing a night shift and had called in but that she couldn’t wake mam up… I left home immediately and arrived to the hospice just after my daughter had left. Monnie was still asleep. She eventually awoke, yet was quiet and had no words compared to the previous night when she was full of life and wit. As the morning progressed a member of her team came in to attend to her, and as I was leaving to give them privacy, I heard him ask her if she wanted to be made more comfortable. I saw my mam gaze into his eyes with trust and acceptance as she whispered ‘yes’. I returned a few moments later and mam was lying back in her bed, comfortable and relaxed. I took out a book and began reading as I held her hand. I asked her if she wanted anything, and she shook her head. I told her to rest and to sleep and that I would stay with her. She closed her eyes as I continued to read. At some stage I attempted to move my hand in hers, but she held on fast… eventually she fell asleep and her hand in mine became slack. Looking back I realise that she knew her time had come. I think that she knew the previous evening when she asked for me. My brother, his wife, my son, my husband were all there as she prepared to leave this life and we were privileged to be present during that time. I was the fortunate one to be holding her hand the following morning as she slipped into the peaceful end sleep that she wanted, and I am so glad that I was there with her at that special time. 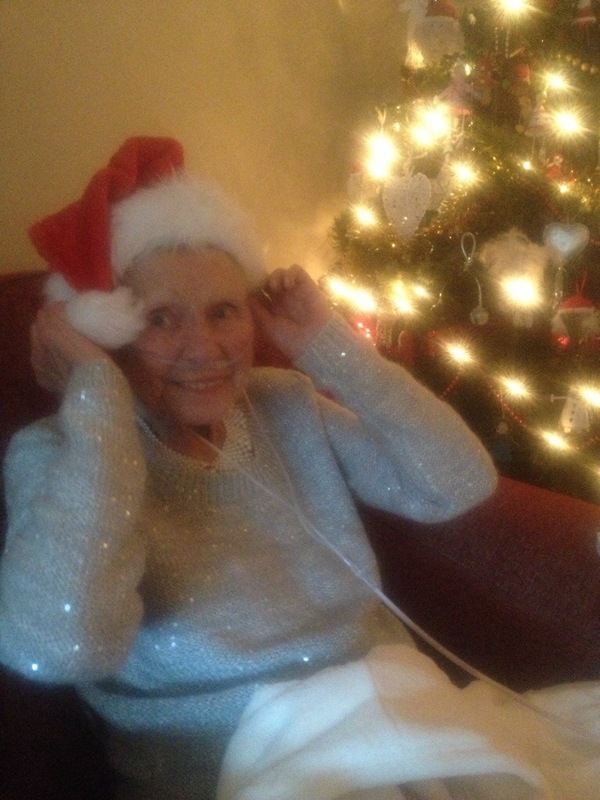 Looking back at this past year as Christmas is almost upon us, I miss her so much. We had a tempestuous relationship but I loved her so. This time of year is difficult for many people who remember loved ones who are no longer present, and I know that I am not alone in my grief as mam was a part of a large and extended family who all miss her. Clichés about ‘time healing’ are well intended, but bring me no comfort. I realise that as I grow older I will lose more people that I love and that this is a simple fact. Life continues on but in a different way. This is a time for reflection, looking back and remembering other Christmas’s past, and I have wonderful memories of growing up in Dublin when Santa visited us as children. Monnie was always at her best on Christmas night singing at the piano as Uncle Paddy belted out show tunes while we kids peeped through the banistairs at the party going on down below. These memories will never tarnish and I treasure them. Although I will always miss her, I will remember Monnie this Christmas day with a smile and wish that she was still here with us. We won’t have gravy on the menu, but we will laugh and smile as we remember ‘gravy-gate’. My life is constantly changing and shifting as I loose people that I love, but I also rejoice in my friends and family who bring richness, variety and love to my life. This is what makes it my destiny. This entry was posted in Chance, destiny, family, happiness, life, love, Miscellaneous and tagged Christmas, Death, Life, Monnie, Mother. Bookmark the permalink.